What does convenience mean to us? Beyond its power as an advertising buzz word or a sure-sell product descriptor, what is convenience? Boiled down, convenience is effort reduced and time saved. It is a short wait over a tedious delay. It is a need met now instead of later. It is the swipe of an app over the endless filling in of forms. Convenience is not a bonus. It is not a fun add on. It is not a lucky extra. Convenience is key to our retail experience. We don’t just want it – we expect and anticipate it in all our consumer interactions. Convenience is precious because it adds up to more free time and energy. At Christmas time, convenience is especially precious because together with saving time and effort, it can save our sanity at a time when many of us a prone to losing it. Think about it. You’ve just spent the forty-five minutes driving around an underground carpark at the local shopping centre trying to find somewhere to wedge your car while maintaining your patience, so you don’t swear in front of the kids in the back. You have a list as long as your arm of gifts and Christmas supplies to buy but you still have no idea what to get for your father-in-law, your notoriously hard-to-buy-for sister, the neighbours who put up with your renovations for the last six months, or your kid’s third grade teacher. You’re hoping that inspiration will strike as you wander the shops and aisles, cranky kids in tow, shopping bags threatening to cut of the circulation in your fingers, and Christmas carol music steadily turning your mind to mush. Oh yes. We feel you. We really do. A little convenience can go a long way at this time of year. Because, sure, Christmas shopping can be fun. But it can also be stressful, time-consuming, and stunningly expensive. It’s no wonder Christmas shopping gets put on the same to-do list as servicing the car and going to the dentist. In fact, a UK study showed that heart rates increased by an average of thirty-three per cent during a high street Christmas shopping experiment. Eighty-eight percent or participants experienced tachycardia – a heart rhythm disorder in which the heart beats faster than normal while at rest; and sixty per cent of shoppers hit shopping fatigue just thirty-two minutes into their Christmas shopping expedition with engagement and interest levels dropping dramatically. Yikes. So why put yourself you through it? Why add complications and stress to an already fraught time when there the perfect Chrissy gift is right at your fingertips? Prezzee eGift Cards make convenience into the sweetest, shiniest, happiest little digital package anyone could ever want – including your hard-to-buy-for sister, your father-in-law, the third-grade teacher, and the amazingly tolerant neighbours. Sanity - saved. A Prezzee gift card is easy to purchase and easy to send. No department store panics, no over-buying in a frenzy of misguided decision-making, no precious hours sucked up by car park queues. Just a quick, convenient, secure purchase that you know will be joyfully received. Yipee! You actually got something you really wanted this year and you can spend it when, where and how you like. Boxing day sales, here we come! No remembering to bring yet another plastic card with you, no chance of forgetting to spend it before the expiry date, just the fun and pleasure of shopping on your own terms with Prezzee’s fuss-free digital dynamo. 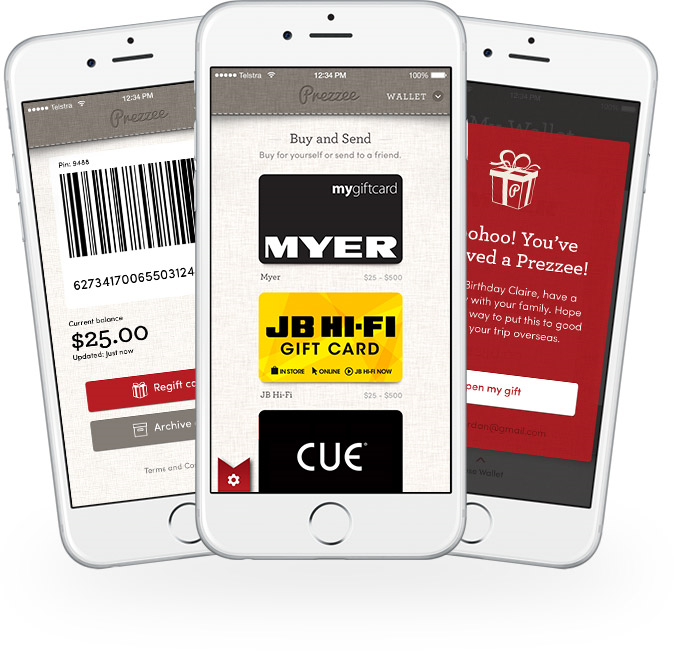 Prezzee makes choosing and arranging your staff gifts a breeze. Need ten eGift Cards? Done. Need one thousand eGift Cards? No problem. Plus, you can personalise and customise all your eGift Cards to make it a heartfelt thank you, not just a generic gesture. And as for the Secret Santa? Ditch all the useless novelty mugs that come with it and be the Secret Santa that everyone wishes they’d got this year buy sending a Prezzee eGift Card. Note to self - don’t mistake convenience for a lack of thoughtfulness. Just because something is easy and quick to buy doesn’t mean it won’t be the most awesome present under someone’s tree this year. You can spend four hours trawling the shopping aisles for the “perfect” gift and still get it wrong. Or you can spend five minutes purchasing and sending an eGift Card and pack it full of love. Then spend the time you’ve saved doing something that really matters – like having a summer swim, playing with your kids, or putting your feet up with a good book and a glass of wine. Show us a convenient Christmas and we’ll show you a stress-free one at Prezzee.